This trophy was awarded irregularly until the 1960s. It was named after Brian Evans from 1972–84, and was re-christened the Bob Rose Award in 1988, in honour of one of our most revered figures. Rose actually had an average record in finals from 16 matches (5 – 1 – 10) but it was his play in big matches throughout the home-and-away season which made him a champion. From the 68 games he played at Victoria Park he kicked 110 goals and enjoyed a strong winning record (54 – 0 -14). 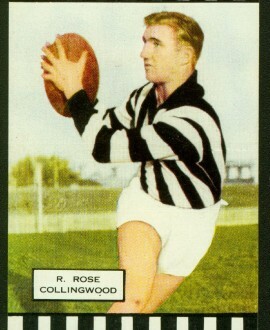 In his final year in 1955, Rose kicked a career best seven goals against North Melbourne in round two and proved he could still play damaging football at the highest level.